Ex-National Union MK says he will run again, regardless of how high the minimum threshold is. Dr. Michael Ben Ari, Chairman of Otzma Yehudit, said Sunday at the 25-year memorial ceremony for Rabbi Meir Kahane Hy"d that he intends to run in the next Knesset election. "I was asked if I am running for Knesset," he said. "No question whatsoever. I am running for Knesset because there is no Right in the Knesset and I do not care if there is a threshold or there isn't one." Ben Ari was a Knesset Member for the National Union party until 2013 but has failed to make it back into the Knesset. In the last election, his party ran on a joint ticket with ex-Shas MK Eli Yishai but failed to pass the threshold into the Knesset. 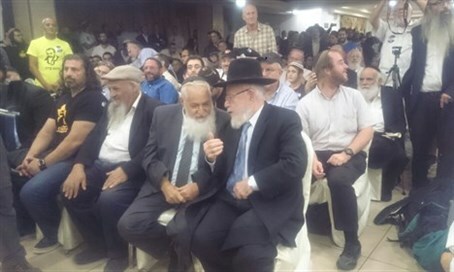 Rabbi Dov Lior, former Rabbi of Kiryat Arba-Hevron, took part in the memorial ceremony for the first time. "Rabi Kahane is not dead," he said. "He is alive and we continue his path. The army should operate the way an army operates, not like politicians." Nationalist activist Noam Federman said: "We have no problem with the Arabs. We have a problem with the leftists and they need to be taken care of."